Free Voice Recorder is a free voice recording software, it can help you to record sound through the computer microphone to generate MP3 audio files or WAV audio files, enable you record your voice and save it permanently. This software is a completely freeware, simple and easy to use. This voice recorder can help you to automatically record voice chat, voice blessing, or record your singing voice and sound of musical instrument playing, you can upload recorded voice to the Internet and share with your family and friends. The use of this recorder is very simple. After software launched, press "Save" button to set an output file, then press "Record" button to start recording, software will display sound volume while recording. Finally, press "Stop" button to finish recording and save data. After recording is completed, you can press "Play" button to listen the resulting file. 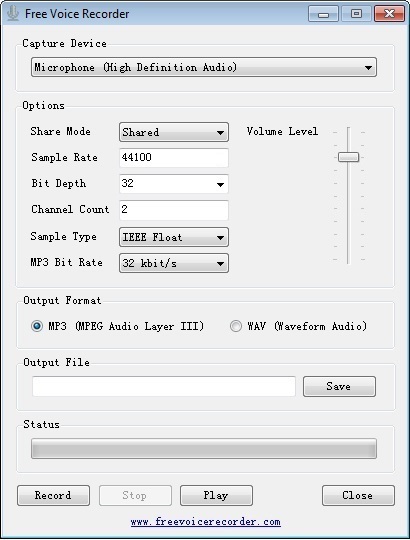 MP3 is the default output format for recording, sound data will be compressed, this format will filter out some of background noise, so generated file is relatively small. WAV file stores uncompressed sound data, the resulting file size will be much larger than MP3 audio format. Select an audio capture device, by default, it will be the default microphone in your PC. Share Mode value can be "Shared" or "Exclusive". The number of samples of audio per second, the default sampling rate is 44100. The number of bits in each sample, the default value is 32, through drop-down box, you set other value, for example: 4, 8, 11, 16, 20, 24, 32, 48, 64. 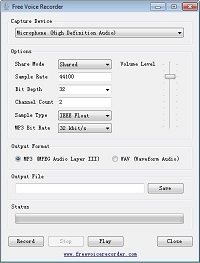 The channel count for the audio file, the default value is 2. Sample Type value can be "IEEE Float" or "PCM" (Pulse-code modulation). The number of bits per second in MP3 audio, the default value is 32 kbit/s, you set other value, for example: 64 kbit/s, 128 kbit/s, and so on. By moving track bar, you can adjust record level for sound recorder, the higher this value, the greater recorded sound. System Requirements: Windows operating system (x86/x64) and .Net Framework 4.0 or later.